I decided this year would be my American trip of discovery year, Scotch is becoming so expensive that it’s becoming off putting and I’ve always been intrigued by what America has to offer so I thought; why not? My first American spirit was Southern Comfort as a 14 year old, it did not end well and I still feel unwell even looking at a bottle, my first grown up, ish, experience with our American cousins offerings was, obviously, Jack Daniels. Jack Daniels is okay, it’s very expensive for what it is but it mixes okay, it’s very distinctive (and yes I know bleach is too but let’s not get too bitchy) and it’s where most peoples adventure with American spirits ends and sort of was for me, for a while. Skip forward a few years and I’m starting to get into whisky properly (for the duration of this piece I’m going to call everything whisky, if you’d like to point out why I’m wrong feel free to do so but to your friends, perhaps on social media, because I’m not listening) Scotch was and still is my thing but I also found enjoyment in several American whiskies too, Buffalo Trace (Buffalo Trace still makes the best whisky sauce for sweet stuff by a country mile), Makers Mark, Woodford Reserve and Wild Turkey are all part of my whisky history as well as one foolish drunken moment when I ordered several Pappy Van Winkle’s when already hammered for people who don’t even drink spirits in a bar in Glasgow, oh how my empty wallet mocked me the next day. Now, I don’t wish to sound uncouth but whilst I’ve enjoyed many a bourbon there is a lot of similarity between them especially the sort you can get in supermarkets, like the ones I’ve mentioned, then last year, in a bar, I ordered a glass of Balcones Brimstone and it utterly blew me away, I know it’s not to everyone’s taste but no one can say it has those warm vanilla, clove and toffee notes than American Whisky is know for. 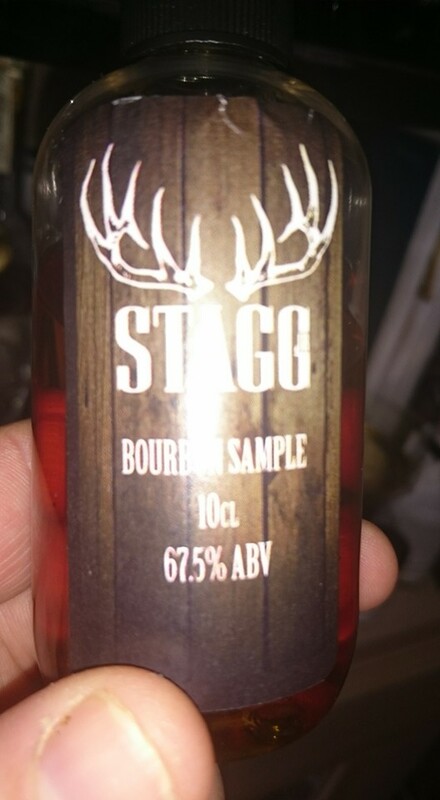 I have now collected a handful of bottles and samples and I’m slowly taking notes on all them for review and during the week after a particularly trying day at work I opened my sample of George T Stagg’s wee brother Stagg Jnr, bottled at 67.2% which is ridiculous but, like the Balcones range, I have been totally blown away by how good this spirit is. Nose. Swirled round the glass and left to sit for five minutes and as the lines on the glass stick to the sides I get a beautiful aroma of toffee and pecans, dark chocolate and light milky coffee, adding water allows more wonder to be released, treacle and oak, leathery and rich, I could sniff this for hours. Palate. Now, I did something I wouldn’t normally do when drinking a spirit over 50% and I let a drop or two touch my lips without any water, neat spirit at that strength is a powerful thing indeed and to say it knocked me back a bit is an understatement, close your eyes and imagine kissing the most the perfect person in the world but their lips are made from broken glass and dipped in liquid hate and you’re there. Even with a good 25% added water I found this to be a very intense experience. Allowing only a tiny amount to enter my mouth at a time so as to not overwhelm me I got an intense sharp sweetness raspberry jam springs to mind, pecans again, Nutella and All Spice, perhaps even a touch of Old Spice, just kidding. I left one glass with a little water for an hour to see where it went and it was awesome, sherry soaked dates and raisins, rum and vanilla ice cream, A fantastic dram. Finish. The Power of the spirit made this last for ages, minutes later I could still feel vanilla pods, rich dark chocolate and sharp raspberries. I think by now, if you’re still reading this, that I’m really enjoying it, so much so that, and don’t tell my wife this or she might shout at me, I’ve ordered myself a bottle or two. If you’re a malt snob then you’re probably not even reading this but if you’re wanting to experience a truly fantastic spirit then I’d hunt this down. My only regret is that I have largely ignored what America has to offer until now just as prices are becoming as laughable as Scotch has. Next Wild Turkey 40.5% Kentucky Straight forward drinking.